Mrs Rosina //Hoabes (photo R) and Mr Nehemia Salomon (Photo S), chairperson of the Management Committee of the Swakopmund Town Council, were delighted to receive a complimentary copies of the book from Mr Rod Braby. A total of almost 2000 copies will be on sale at retail outlets in Namibia. Proceeds from the sales will contribute towards a reprint. Book sales make a direct contribution to conservation of the coast. 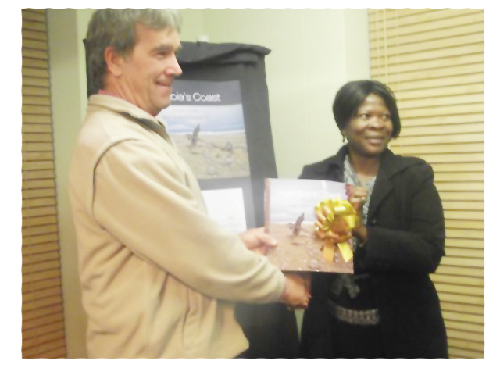 A new book was recently launched in Swakopmund to foster a better understanding and appreciation for the unique environment where desert meets cold Atlantic ocean. Now, any reader can enjoy Namibia’s stretch of coastline in 192 pages. Although pure enjoyment for thie mind and eye, this is not just a coffee table book. The book NAMIBIA’S COAST; ocean riches and desert treasures launched by the Mayor of Swakopmund Mrs Rosina //Hoabes on behalf of the Minister of Envirionment and Tourism, Honourable Netumbo Nandi-Ndaitwah, is one of the more than 400 awareness activities of the Namibian Coast Conservation and Mangement (NACOMA) Project. The book blends pictures of coastal scenery and factual information collected over the life of the NACOMA project to serve as a source of well-researched facts on the Namib Desert and the Benguala current that drives the so-called Cold Upwelling. This in turn is the source and foundation of the rich fishing fields in the shallow coastal waters. The book was produced by RAISON (Research and Information Services of Namibia) and published by the Ministry of Environment & Tourism. The authors Tony Robertson, Alice Jarvis, John Mendelsohn and Roger Swart were also reponsible for the publication of the Atlas of Namibia. The design and layout by Sandy le Roux contribute to an attractive book easy to read for the intended wide spectrum of readers and users. 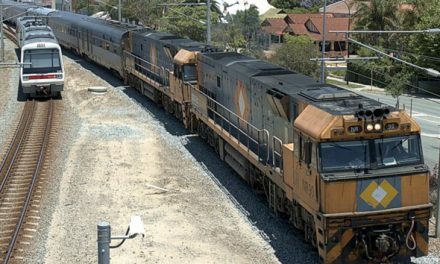 The information is divided into seven chapters namely Introducing the Coast of Namibia, Weather and Waters, Foundation and Landscapes, The Living Coast, People of the Coast, and Economic Resources and Activities,. The last chapter, From the Past to the Future focuses on the balance between conserving the environmental beauties and heritage and the need for propsperous economic activity.